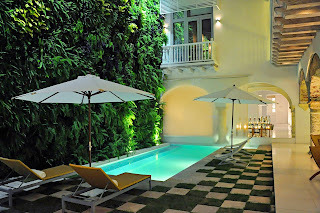 I arrived to Cartagena de Indias on my birthday. It was Sunday morning, exactly 17 days ago. At 8am, I checked into Casa Boutique Veranera, an adorable five-room hotel built around a leafy inner patio in the San Diego quarter of the old town. The day started with a delicious Cartagenero breakfast: fried arepas with egg and a plate of fruit, accompanied with freshly squeezed juice and delicious Colombian coffee. Exhausted from the intense run around Medellín for four days, I then decided to take a siesta. And what a sweet nap it was. After a stroll around the wistfully beautiful old town, I returned to Casa Veranera for another siesta. I was determined to take it easy on my birthday! My room – cozy, cheerful and well-equipped – opened up onto a rooftop terrace. So the second siesta of the day found me lounging on the terrace of Casa Veranera for another two hours, feeling the breeze coming off the sea and watching the sun light fade, slowly.